Developer TransCanada has had these pipes ready since at least 2014. 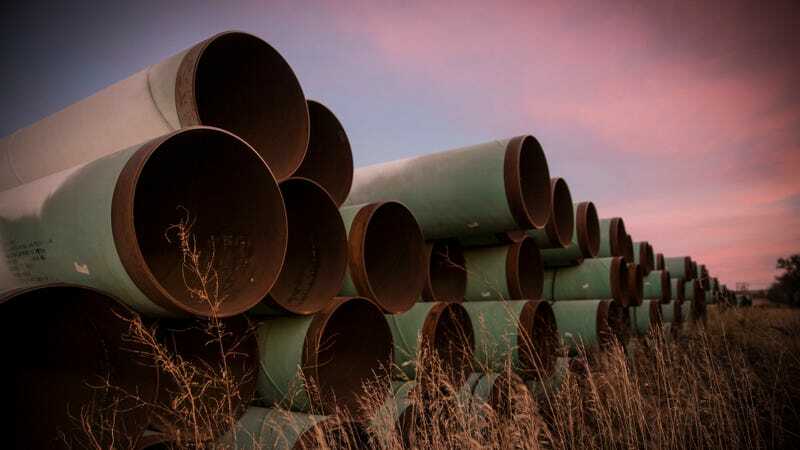 Earlier this month, a district court judge in Montana halted all construction on the Keystone XL pipeline in a major symbolic victory for environmentalists. Now, that judge is allowing developer TransCanada to go ahead and begin preliminary planning for its construction work. U.S. District Court Judge Brian Morris made this decision Wednesday, per the Associated Press, after the energy company made the request to continue this preliminary work Tuesday. This ruling will allow TransCanada to proceed to plan work, meet with stakeholders, and finalize contracts and permits. Sorting out all this is key for the project to stay on schedule to begin construction early next year. The judge still has to decide whether TransCanada can continue with road upgrades, moving around pipes, and preparing sites for work camps. Judge Morris pumped the brakes on this controversial 1,179-mile long crude oil pipeline after ruling that its presidential permit ignored key impacts to climate change. Now, the project can’t move forward before the State Department includes information on greenhouse gas emissions, as well as on potential impacts to cultural resources and updated oil spill modeling, in the analysis. Paperwork around contracts and meetings would’ve delayed the project further, but the judge is apparently playing nice. Opponents, however, won’t. They haven’t been for the last 10 years. They don’t want this pipeline going anywhere near their natural resources, their land, or their water—especially indigenous peoples. Once the new environmental review is in, the judge can really decide whether this pipeline will happen. Of course, that decision can be appealed, but there’s always the chance TransCanada will finally give up. No one should hold their breath on that one, though. As for opponents, they’re keeping a watchful eye on the different construction sites near their communities. Should any activity happen, best believe they’ll make some noise.